Malwa Dal is a tuvar dal based accompaniment which is simmered with generous tadka of spices. It tastes the best with Bafla, Jeera Rice or piping hot phulkas. Here is how to make it. My childhood was full of surprises and adventures. Though I was born in Rajasthan, I have stayed for a significant time in the Northern part of India as well. And, finally, I have settled down in Bangalore. My experiences of having stayed in various cities of India has allowed me to learn the best things about various kind of cuisines, cultures, and in sum total, it has made me a better person! Also, the idea to experiment with umpteen cuisines, making fusion dishes comes from this journey! Though I like homely meals such as Navratan Dal and Zeera Rice, I like to make Dals of different states of India and recount my childhood. Malwa Dal just like Panchratna Dal was often made at my home and we liked it very much because of tasting it once at my friend’s place. The Malwa region covers western-central areas of both Rajasthan and Madhya Pradesh and it has been influenced by the culture of both the states. 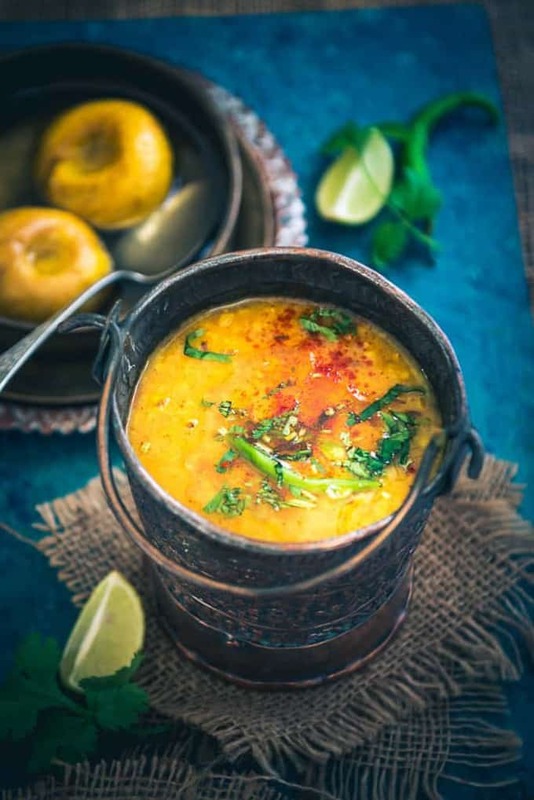 Malwa Dal is one such delicacy which is relished along with Dal Bafla (Steamed Dal Baati) and it brings out the goodness of two different cuisines. Malwa Dal is made using Tuvar Dal, tomatoes, turmeric et al. Its tadka is prepared from ginger, garlic, green chillies and more. The taste of Malwa Dal is fabulous and as it is garnished with lemon juice, coriander, it becomes all the more palatable. This Dal can be savoured with rice or with piping hot Phulkas. Because of the kind of lentil and tadka that we have used, Malwa Dal has its signature flavour which cannot be substituted. For a change of taste and to bring a variety to your daily meals, make Malwa Dal and appease your taste buds, without fail! 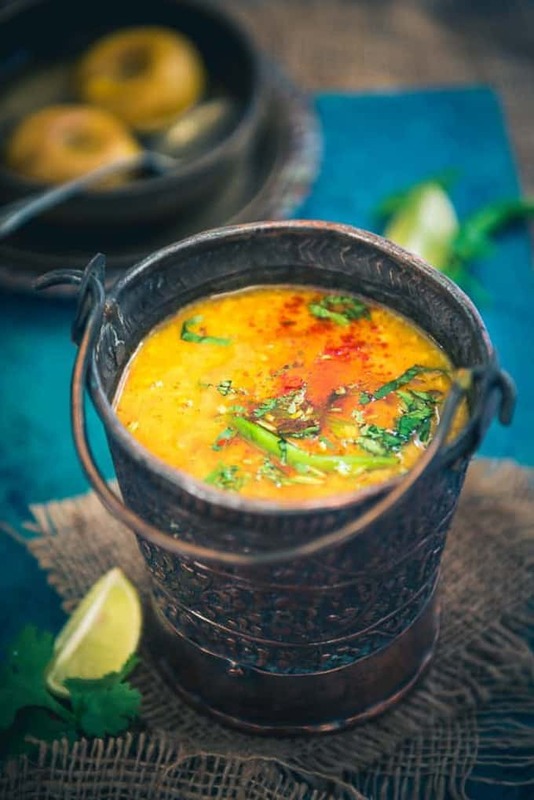 Malwa Dal is a tuvar dal based accompaniment which is simmered with generous tadka of spices. It tastes the best with Zeera Rice or piping hot phulkas. 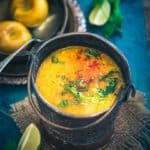 Wash the dal and add it in a pressure cooker along with 3 cups of water, turmeric powder, salt and tomato. Pressure cook until dal is done. Let the pressure release and then open the lid of the cooker. Heat ghee in a pan. Once the ghee is hot, add hing and zeera and let them crackle for a few seconds. Add ginger, garlic and green chilli and fry until garlic becomes slightly browned. Switch off the heat and add red chilli powder in the ghee. Immediately pour the tadka in the dal. Add lemon juice and mix well. Serve hot with baffle or Phulke. It looks delectable, but what the heck are hing and zeera? Hi Jennifer. Thnx :). Hing is asafoetida and Zeera is cumin seeds. I will update the recipe with english names. You will find these two in any Indian store near you.